Welcome to Dreamydoodles Northwest Available Puppy Page! Dreamydoodles is one of a very small handful of Australian Labradoodle breeders in the Untied States who breeds the Merle colored Labradoodles! We breed both the Medium & Standard size Labradoodles and the Mini and Standard size Aussiedoodles! We also get light green, hazel, bright amber, yellow and blue eyes in both breeds of puppies! Dreamydoodles is Located in the Great Northwest Woodland, Washington State and our breeding partner Jennifer from Sprout Creek Doodles is located in Powell Butte, Oregon! Dreamydoodles is NOT a commercial kennel or “breeding facility”. We raise all our puppies in our homes. Not all these puppies are located in one home either.. some are raised in my home in Woodland, my partner Jennifer’s family raises a few litters a year in Oregon and our F1B Mini Aussiedoodles are raised by my sister Nicole in Vancouver, WA once a year. It’s been important to me from day one that all our parent dogs live as pets not just “breeding dogs” and that their puppies also be raised in the home with kids and family. 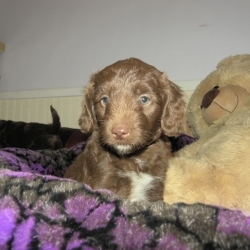 About our Available Multigen Labradoodle Puppies..
We currently have two available 10 wk old Male Multigen Labradoodle and one female ready to go home now and new and upcoming litters going home in May and June! ALL THREE AVAILABLE BOYS are absolutely adorable and sweet and will be smaller standards! Not too big and not too small! A more compact version of the larger standard size Labradoodle! TAKING A DREAMYDOODLE PUPPY HOME! We breed the Medium and Smaller Standard Australian Labradoodle and the Mediums are (30-35 lbs – 17-18 inches) and the Smaller Standards are (40-45 lbs – 20-21 inches) and then we also breed the Standard and Miniature Aussiedoodle. 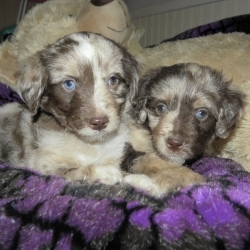 The Mini Aussiedoodles are (15-20 lbs – 14 -16 inches) and the Smaller Standards are (40-45 lbs and 21-22 inches). BELOW IS A ROUGH EXAMPLE OF THE SIZES WE BREED. The examples below are of Goldendoodles so they’re structured a little differently, for example our Mini Aussiedoodles have shorter bodies in length, more porportionate to their height so if they’re 14 inches tall, then they’ll be closer to 14 inches long (minus the tail). Same with our Labradoodles. 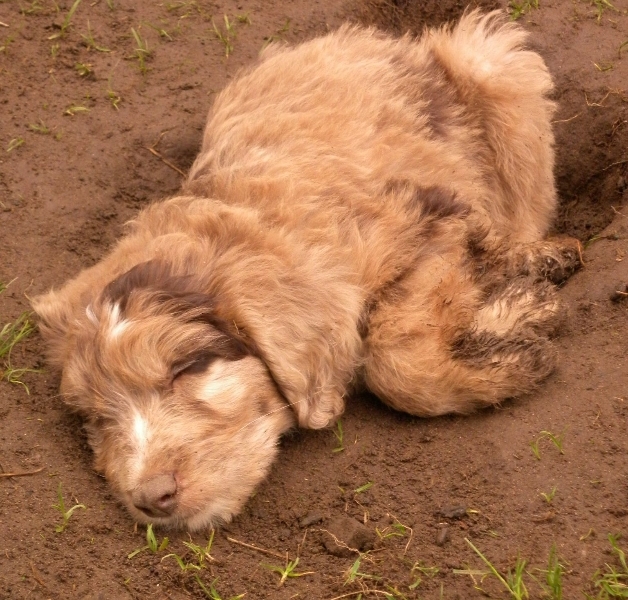 Goldendoodles are usually bigger and heavier boned. This is still a great visual for our Labradoodle and Aussiedoodles and the height differences between the three sizes!! THE 3 SIZES OF DOODLES WE BREED! 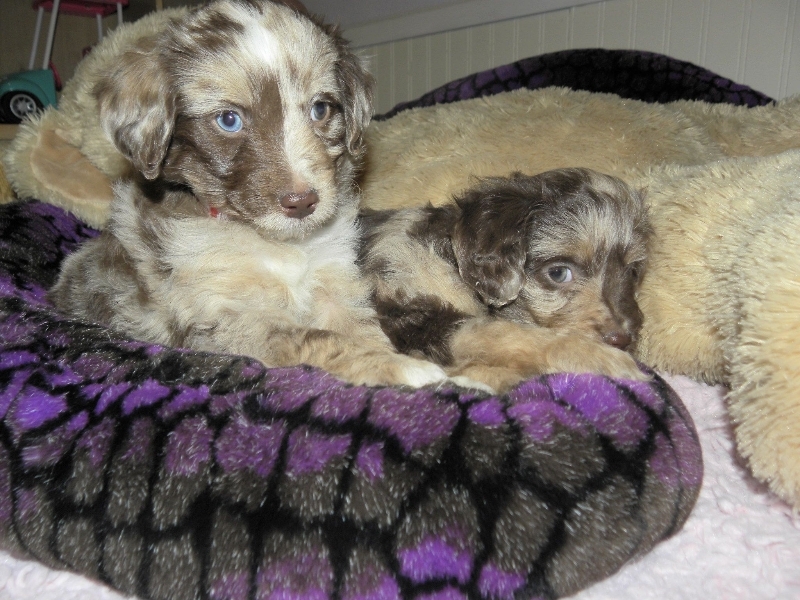  New puppies crying in their crate is one of the hardest parts about taking home an 8 wk old puppy, taking them away from their littermates & Mom for the very first time is rough for them and there is always an adjustment period. Getting your new puppy on a set feeding/sleeping and eliminating schedule is the key to potty training and we have already started for you!  READ MORE: How to Potty & Crate Train Your Puppy in 7 Days! Daddy Apollo in the Whelping Pool with his babies! Genetic Testing: Clear and Good, testing done through Embark, for over 150 common genetic diseases – copies of results available on request! Mini Aussiedoodle’s Sire: Little “Georgie” – he is a 13 lb – 14 inch tall Silver Beige Mini Poodle lovebug! A real life Teddy Bear with the funniest personality to match! He’s a great kids dog! 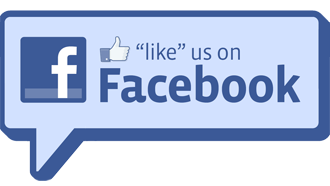 • Also visit our Dreamydoodle Family Group on Facebook! – Just for the families who own one of our Dreamydoodle puppies! What’s a Dreamydoodle Dog Like? Mattie a Beautiful and Well Groomed Aussiedoodle! Dreamydoodles are that “Special Kinda Dog“! You know the kinda dog that you wanna take everywhere you go! The kind of dog that’s a beloved family member, that everyone knows by name and wears a special scarf! The kind of dog that when they look at you.. you swear they’re half human!? Believe me, it’s so true! The kind of dog that can be an emotional support, therapy dog or a service dog, a champ on the agility course or at dock diving! Yep, we have a few of those too! They love to swim! You can take them on a cross-country road trip, camping, hiking or hunting and they’ll be game for it all! Whatever’s on YOUR schedule… Both our Aussiedoodles and Labradoodles regardless of size… just wanna be with you and will be ready, willing and absolutely able to do it ALL WITH YOU! You Will Get Out What You Put Into Your Puppy! Of course, it’s not all that EASY either… we can’t promise you the perfect all around dog from day one.. we can however provide you with a well proven & great base puppy to work with! But of course you still need to socialize and train your puppy for them to reach their full potential! 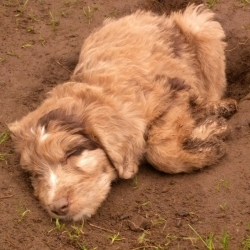 Aussiedoodles and Labradoodles are both highly intelligent, adaptable and intuitive dogs. The Poodle is the #2 Most Intelligent breed only after the Border Collie. The Labrador Retriever and the Australian Shepherd are two of the easiest to train and most loyal dog breeds. So, if you’re looking for a smart and easy to train dog then look no further. I definitly recommend our families train their own dog, instead of sending them away to a trainer. You are the one they need to respect and connect with. Start off by introducing them to as many new experiences and situations as possible and LOTS of new people, sights, sounds and even smells starting from a very young age.. The first 4 months of a dogs life is the most important stage of development! Just stay away from high dog traffic areas until after 16 wks but get them out into the world right away and I have no doubt your Dreamydoodle can do whatever you have your heart set on doing! Standard size – Dreamydoodle – Multigen Labradoodle “Aero” passed his “Good Citizen” obediance test before the age of one, started Dock Diving and now at 2 years he’s already an agility and dock diving champ! His Mom has helped Aero reach his full potential and he’s one happy & accomplished Dood! DREAMYDOODLE’S CAN AND HAVE DONE IT ALL! Luckily we have some pretty amazing Dreamydoodle families, who’ve kept us up to date on all their Doods lives, so we’ve gotten to see them do it all from surfing, yes really, to riding on jet skis!! Standard Aussiedoodle “Kula” and his owner Syd on a wave runner! Check out more of Kula’s adventures for yourself! Hop over to our Featured Families Page and also our Family Group Page on Facebook! To see more updates on our Dreamydoodles lives! My main goals as a “Doodle breeder” from the very beginning was to produce “My Dream Aussiedoodles and Labradoodles!” The kind of Doodle that I would pick for myself. My Dream Dog.. or in our case, a Dream Doodle! I’ve put a lot of care, time and money into picking only the very best parent dogs for our breeding program and I’ve been breeding our Labradoodle bloodline for over 10 years and over 5 generations now. I’ve also added  some Amazing dogs from purebred champion lines as well. A tall order? Yes! but all points are so important that if they’re missing even one, they don’t make the cut. Having a strict guideline definitely helps me. Temperament is definitely genetic in Dogs! A solid temperament has always been #1 KEY for me. If you wanna know what you’re puppy might be like as an adult, just meet the parents! Dreamydoodles are easily recognizable with their stand out personalities and striking beauty! Beautiful body structures, soft non-shedding coats and above all else..BRAINS! Dreamydoodles Northwest breeds for Genetic Health, Temperament and Quality Coat in that order. Our parents dogs are Genetic tested clear and the testimonials from our past Dreamydoodle families have been  Awesome! We update our own Facebook Page everyday with either updates of our current & available puppy litters or updated pictures of puppies who’ve recently gone home! We also have an AMAZING and Active Dreamydoodle Family Group where our Dreamydoodle puppy parents can go to share their doodles updated pictures and videos! Which has been so much fun to watch! Just some random pictures of past puppies and updated pictures of them as adults.. none of these puppies or dogs are currently available. We have so many its impossible to choose which ones to share so I just picked randomly. I did try to show off all the neat colors we’ve had over the years. 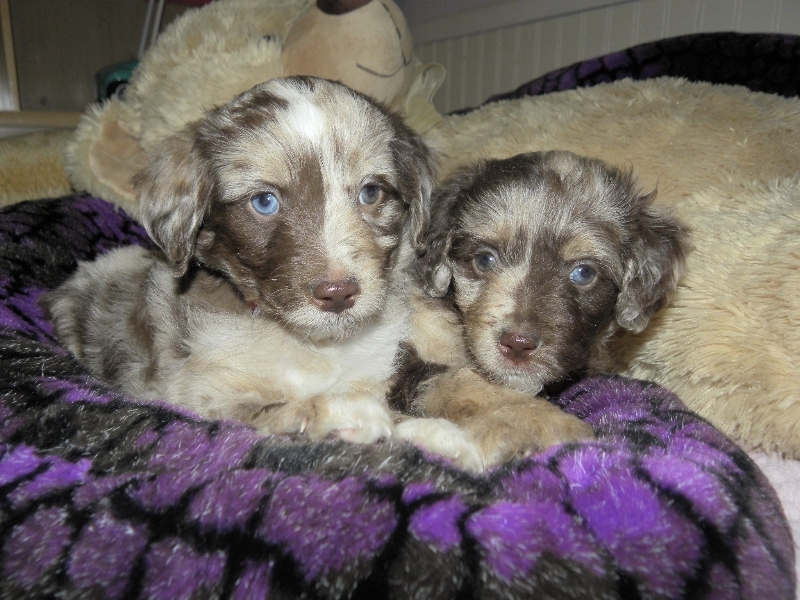 A Word about Our Merle Colored Puppies..
Our Merle colored Labradoodles and Aussiedoodles are very popular and so they do go very fast.. while we do get merle colored puppies in almost all of our Labradoodle and Aussiedoodle litters they also get picked first and we only have 1 to 4 per litter and 4 is like.. Wow! Lucky! 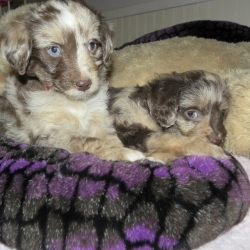 So, if you’re specifically interested in a merle colored puppy, in most cases, you will need to have patience and wait awhile, you’ll also need to put down a deposit on a future litter and be at the top of the list. 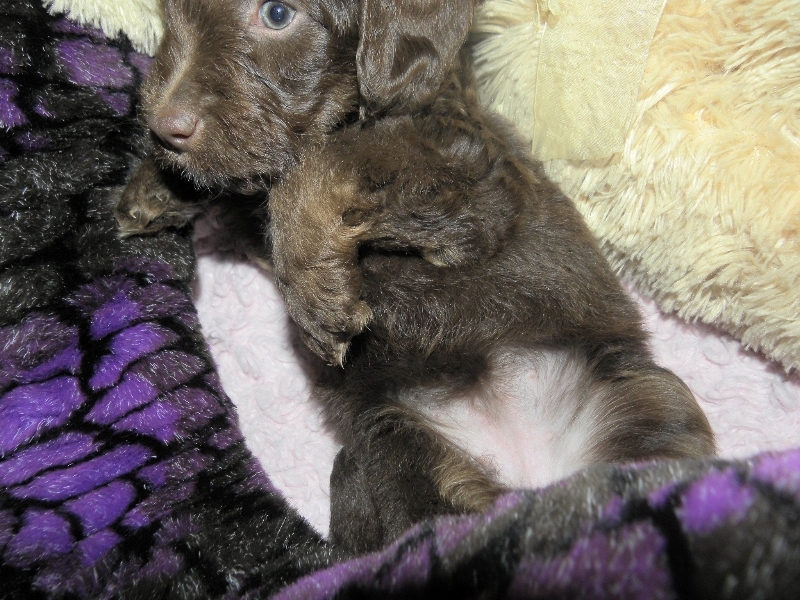 We very rarely have Merle colored Labradoodle or Aussiedoodle puppies that are NOT already on hold before their born or shortly after. Luckily, we also have some truly beautiful solid colored puppies too, that are just as beautiful! Like our Real Life Teddy Bears in solid Black, Chocolate, Cream and Apricot and we also get some Bi’s, Tri’s and Parti colors too! Mini Aussiedoodle after passing the Good Citizen Test! 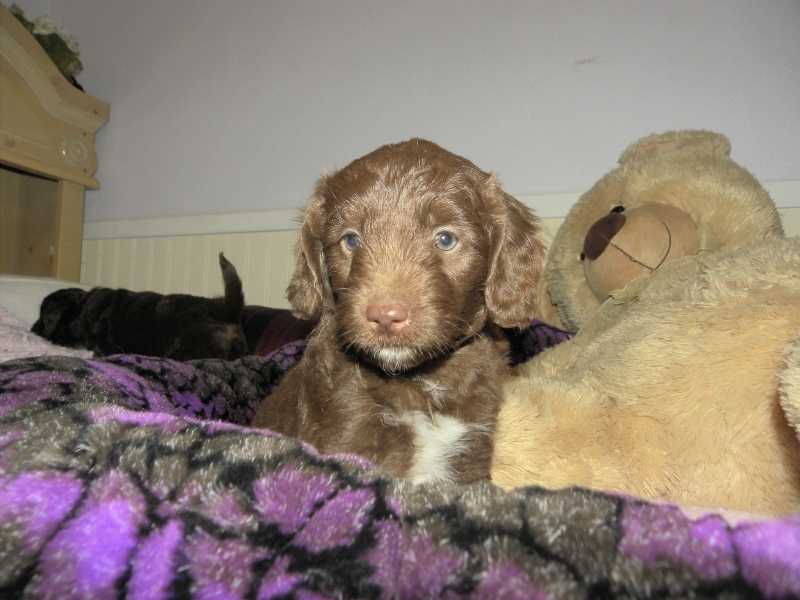 Chocolate Multigen Labradoodle Puppy – What a Face! 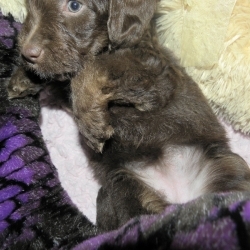 Multigen Labradoodle Puppy from Sissy and Apollo! 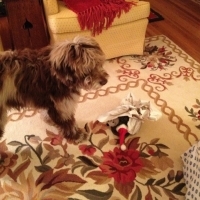 Mini Aussiedoodle Chocolate Boy from Mya and Georgie! 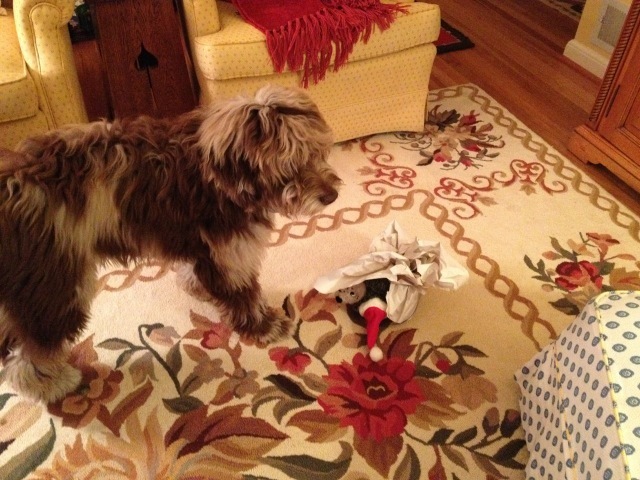 Hugo – Multigen Labradoodle from Pele and Hershey! This boy is the star Doodle on the front of the Poochie Powder bag! Pretty cool Hugo! Great product too! Poochie Powder is an Organic Dog Supplement & Multivitamin | Human Grade Superfoods, Essential Vitamins & Minerals with Disease Fighting Antioxidants for Digestion, Coat & Immune Support – Dog  Approved! Great 100% raw plant based add-on for your dogs kibble, home-made or raw diet!